In 1996 I saw a notice about percussion lessons. This was very high up in my list of things I always wanted to do but never had the chance to - so I joined in, had much fun, bought more and more drums, and ended up playing in two percussion bands, Handgemenge and Viroumania. Playing the drums turned out to be a right brain companion to the left brain work I do all day, and I was really surprised how good it feels to be on stage. :-) I owe much to my percussion teachers, among them Friedemann Mütze , who taught me the basics and having fun with improvisation, and Achim Fischer, who taught technics and feelings and, in a way, helped me to find to more depths of my soul. I also learned playing drumset to some extent, but haven't played that in a band so far. The other band that I was with over the years is Viroumania! 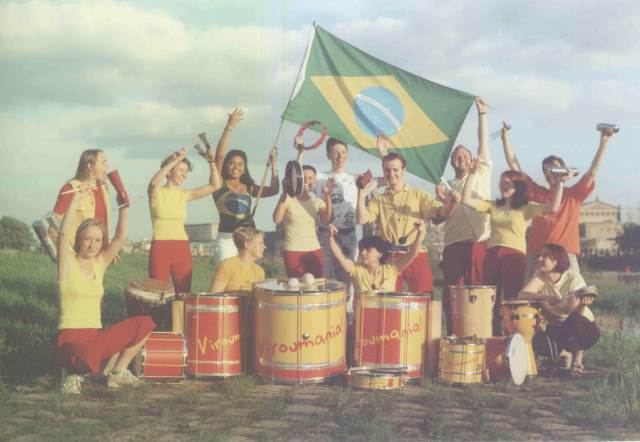 ([virumanie:a]), a Samba Batucada Band. 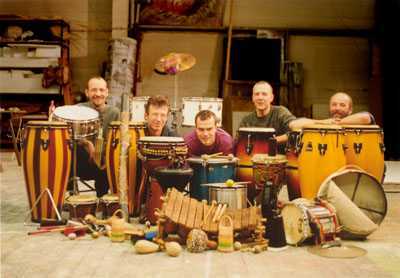 (My Samba Batucada Band.) We started out small, as the church supported Samba Sao Paulo, and became a quite large group of up to 15 people that had 30-50 gigs a year. Unfortunately, I don't have enough time anymore to take an active part in such an enterprise... By the way: you can have a look at the 2003 webpages of the group. Those were done mainly by me, with texts and pictures by my friends. The Website of the current incarnation of Viroumania is here. Ginga Pura is a group learning and performing the unique brasilean Capoeira - a combination of dance and martial arts. Sometimes I joined in the fun as a musician.